Prime Minister Netanyahu concludes Russia visit focused on meeting President Putin about northern border. Prime Minister Binyamin Netanyahu concluded his visit to Russia this evening and held a special briefing. "I finished ten hours with President Putin. The first part was an impressive parade marking the victory over Nazi Germany, which was of historic value marking the first time an Israeli prime minister was invited, and it was important that President Putin mentioned the Holocaust victims for the first time. I also think it's a great source of pride for the people of Israel." Netanyahu referred to the talks he held with President Putin. "In these talks I dealt with two issues: the first was the nuclear archive. I presented the main points of our findings, and soon a Russian delegation will come to Israel and examine the materials. "The second issue was the tension in the region and Iran's attempt to establish itself in Syria and attack us from its territory. We discussed this in depth and insisted on our right and duty to take all steps to protect ourselves from all this aggression." Netanyahu said the main part of the meeting between the two leaders was devoted to events on the northern border. "I conveyed to the Russian side the considerations that guide us and our actions, and I think this was presented in the clearest, most direct, and most honest way. "I don't usually relate what President Putin says, but I will note that these meetings are always revealed, after the fact, in the test of time, as very useful," he said. He declined to comment on whether he had protested to the Russian President about Moscow's intention to sell Assad the advanced S-300 missile defense system. 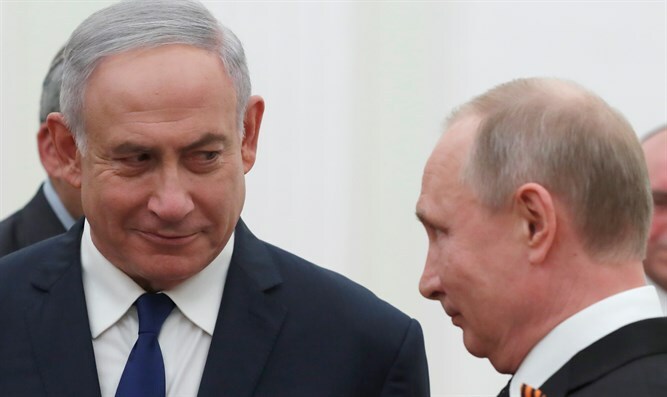 "I preserve Israel's security interests," Netanyahu summed up the meetings with President Putin.